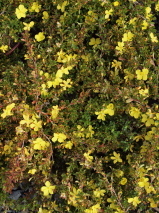 A spreading groundcover with small glossy dark green leaves while the stems are covered in short hairs. Bright open-faced yellow flowers with fluffy stamens are borne almost year round. 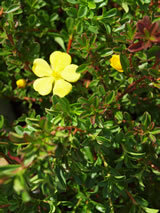 This is a popular groundcover because it flowers over long periods. Good for coastal settings as they do not mind a salty spray now and then. Any well drained an friable soils - they are also quite comfortable in light, sandy coastal soils. Avoid heavy frost.